Ladies, not satisfied between the sheets but holding out that he'll come through on Valentine's Day? Don't let your dissatisfaction simmer for too long, for White Castle could give you a night you wish you wouldn't remember for years to come. Ah yes, the mighty White Castle doesn't want to be left out anymore than the whiney single girl who ironically refuses to shut up. "Make your Valentine’s day STEAMY! Take your Valentine to White Castle on Wednesday, February 14 between 5 and 8 p.m. and enjoy hostess seating, candlelit dining and your own server. Reservations are required, so check the list below for participating Castles near you! Special this year, you can also treat your honey to a romantic White Castle dinner in your home! Cupid’s Crave Kits include eight cheeseburgers, one sack of fries, two regular soft drinks, coupons and keepsake items to heat up your homespun romance. Now, ain’t that sweet?" Mini cheeseburgers come in mini packages, and don't think there's a 'big one' waiting for you under the tree. 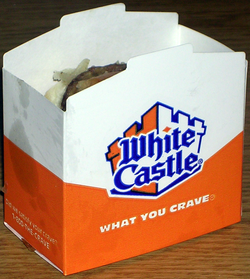 It's fairly safe to say that any man who treats you to White Castle on Valentine's Day should lose any mini-hope you had left for him.